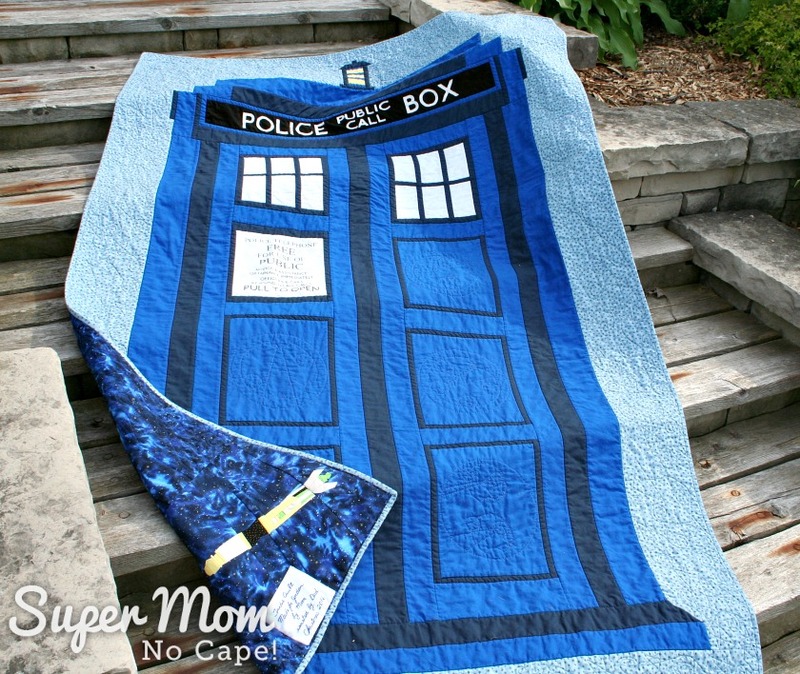 Doctor Who TARDIS Quilt Finish - Super Mom - No Cape! Are you or someone you know a Doctor Who fan? 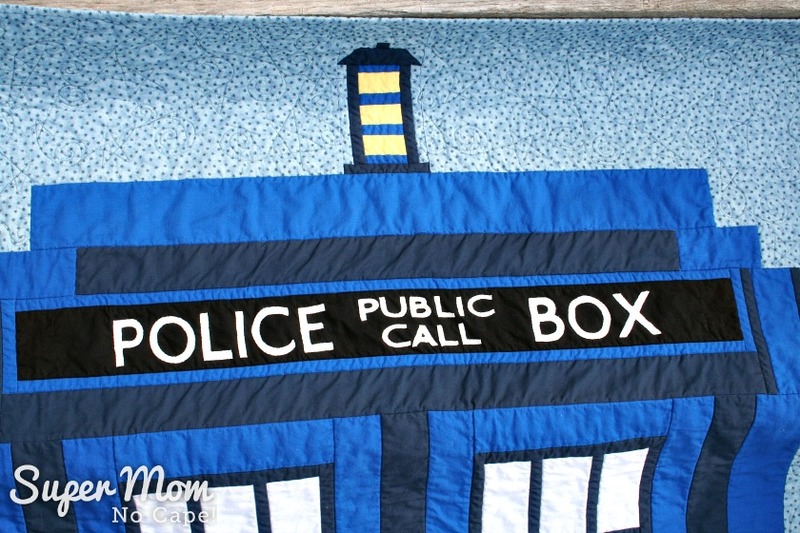 If so, you’re going to love this TARDIS quilt that I made for our son. 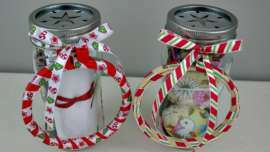 I rarely have any trouble coming up with gifts to make for our girls but coming up with ideas for gifts to make for my husband, Dave and our son is always challenging. So when late last summer, our son showed me a Doctor Who TARDIS bookshelf and storage unit, the wheels started turning. 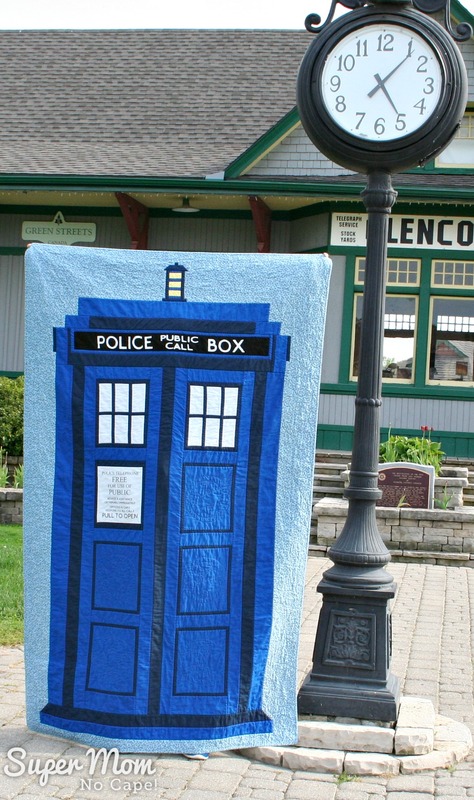 Our son doesn’t have room in his small apartment for Dave to custom build him a TARDIS bookshelf, but a quilt on the other hand was definitely something I could make and give to him for Christmas. At least that was the plan! 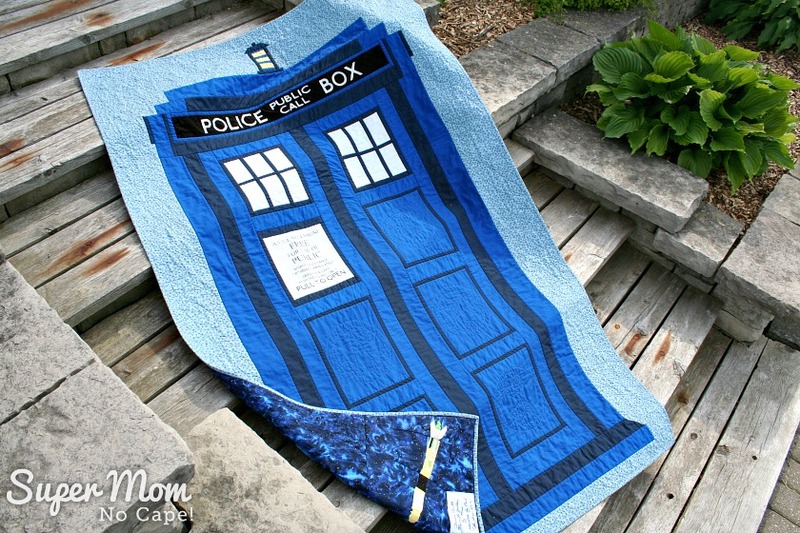 After searching Pinterest, I decided on the TARDIS quilt pattern by Sam Hunter of Hunter Design Studio. Once I’d downloaded and printed out the pattern, the search was on for fabric. 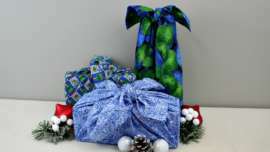 The Kona Navy (dark blue), Kona Ocean (medium blue) and Kona White by Robert Kaufmann Fabrics were bought at Jo-ann Fabrics in Port Huron, MI. The Kona Cotton Citrus came from Kaleidoscope of Quilts... the only quilt shop for miles around with that particular shade of yellow. The border fabric was purchased at Len’s Mill in London, ON. And after looking at dozens of fabrics, I finally found the right silver/grey for the window panes at Sew Many Things Sewing Center. Once I had all the fabrics and they’d been pre-washed, it was time to cut and sew. At that time, I was still sure I could finish the quilt in time for Christmas. However, that was not to be and our son received his quilt as a quilt sandwich wrapped in pretty paper. Nevertheless, I couldn’t have been happier or more gratified with his reaction. 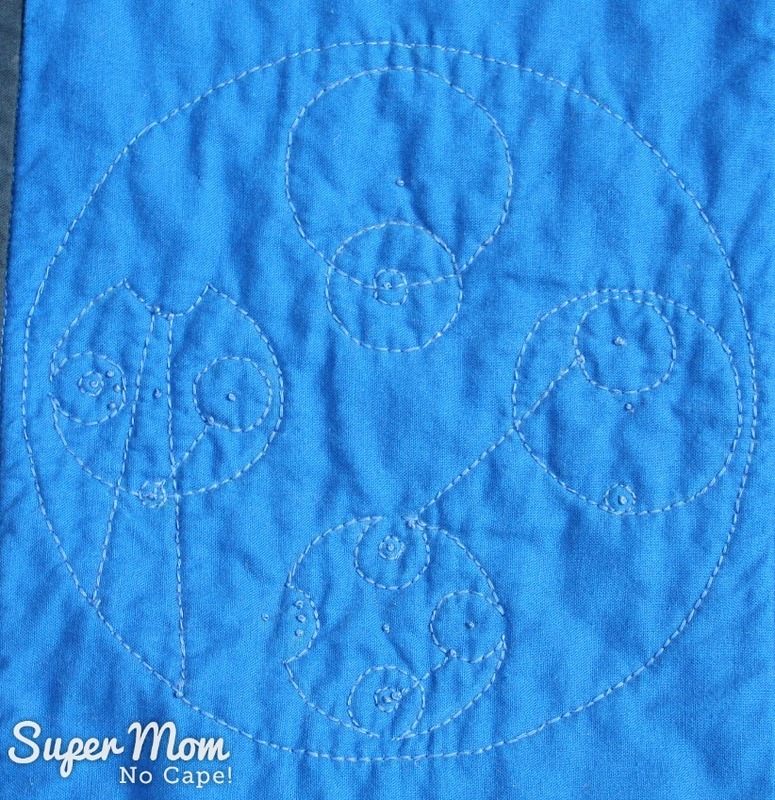 I had folded it with the backing facing outward (which you’ll see in a minute is the perfect fabric for a TARDIS quilt.) When he unfolded it so that he could see the front, he jumped up and ran to get his phone to take a picture to send to a friend. By coincidence they had each gotten the other Doctor Who themed gifts for Christmas! It has taken until the weekend before last to finish the quilt. After I gave it to him that Sunday, we drove to the local train station for a photo shoot. So without further ado… here is the finished quilt! Below is a close up photo of the lantern and Police Public Call Box. The letters were fused to the black background and then I blanket stitched around them by hand. 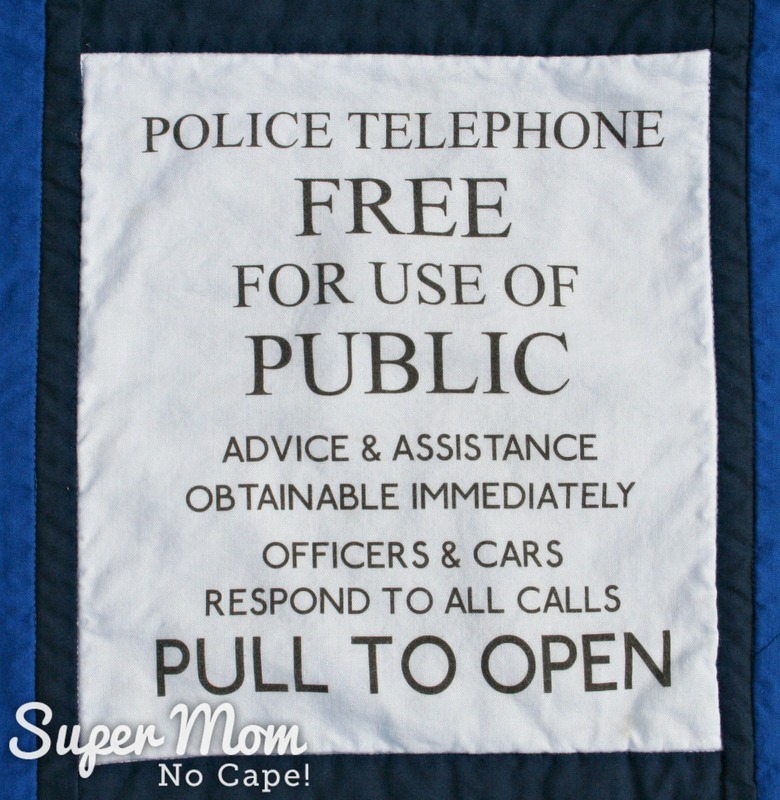 The “Police Telephone – Free for Use of Public” window sign was provided in the pattern. I printed it on to fabric with my ink jet printer. Before making it into the block, I washed the printed panel in a solution of Retayne (<<<affilitate link) and water. After it was rinsed and dried, I heat set it to make sure that the print wouldn’t bleed or wash out. In each of the blank door panels, I stitched Gallifreyan words for our son’s name and four classic Doctor Who words and phrases. According to my research there is no official Gallifreyan language from the creators of the Doctor Who universe but there is one that was created by Loren Sherman. 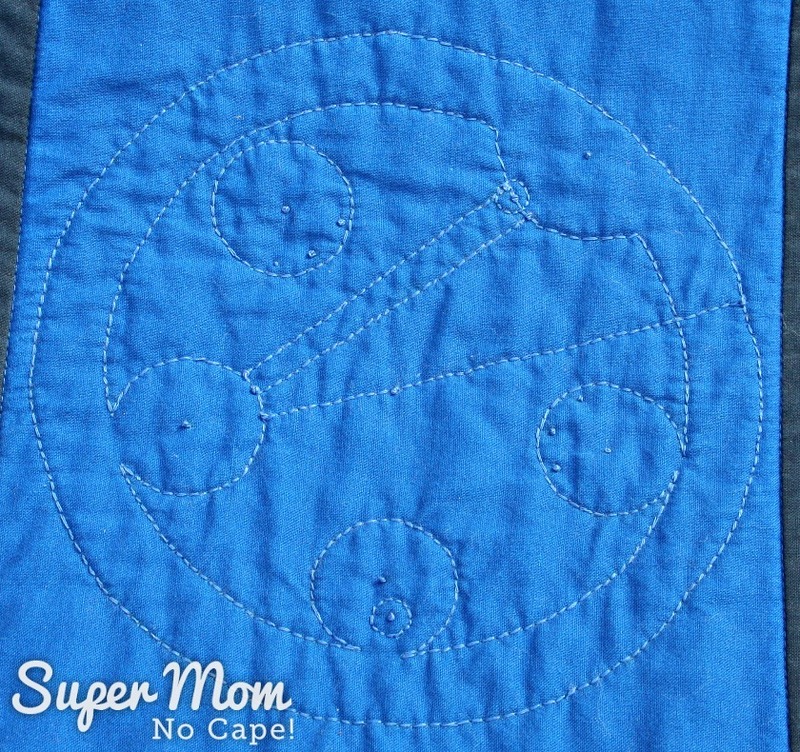 Unfortunately, that site has been undergoing updates for the entire time I’ve been working on our son’s quilt, so I used this Gallifreyan Translator. Now, if you’re a Doctor Who fan, you know that every TARDIS must come equipt with a Sonic Screwdriver! 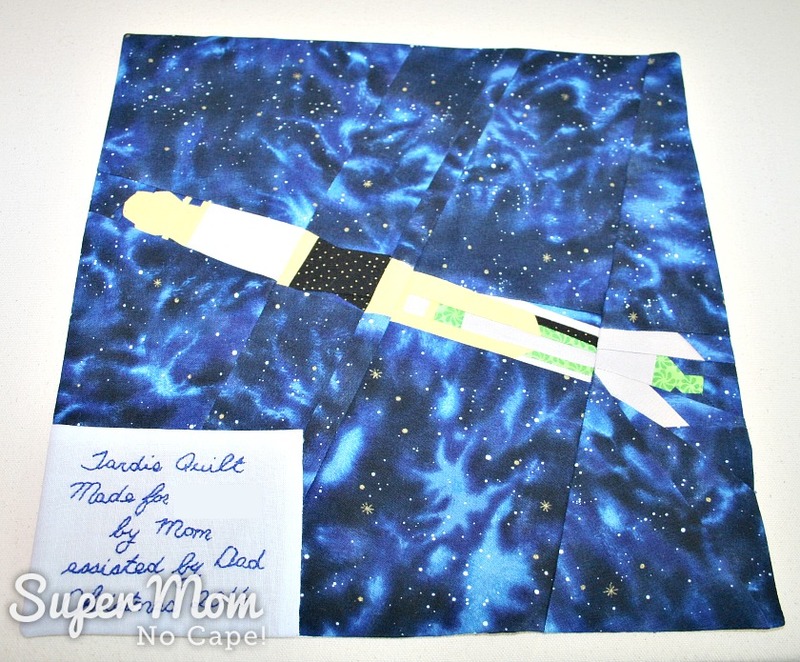 I found a pattern for a foundation paper pieced Sonic Screwdriver on Craftsy. 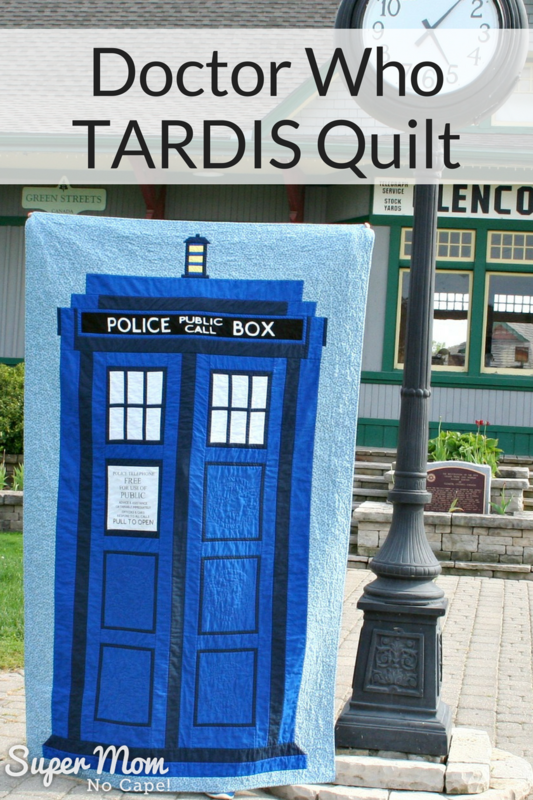 It was free to download from Trillium Design and was one of several blocks from a Doctor Who quilt-a-long which since Craftsy recent closing of several independent designer shops is no longer available. This is by far the most elaborate and detailed paper pieced block I’v ever attempted. There are 59 pieces of fabric in this 12″ block! It took me a day and a half to sew each section and then sew the sections together. A lot of unpicking and resewing happened but in the end I’m super pleased with how it turned out, even if the edges weren’t even and needed to be trimmed to square it up. The original plan was to make the sonic screwdriver the quilt label by writing his name and the date the quilt was made, etc on various parts of the screwdriver but after spending that amount of time sewing it all together, I didn’t want to take the chance that I might ruin it and have to start from scratch. 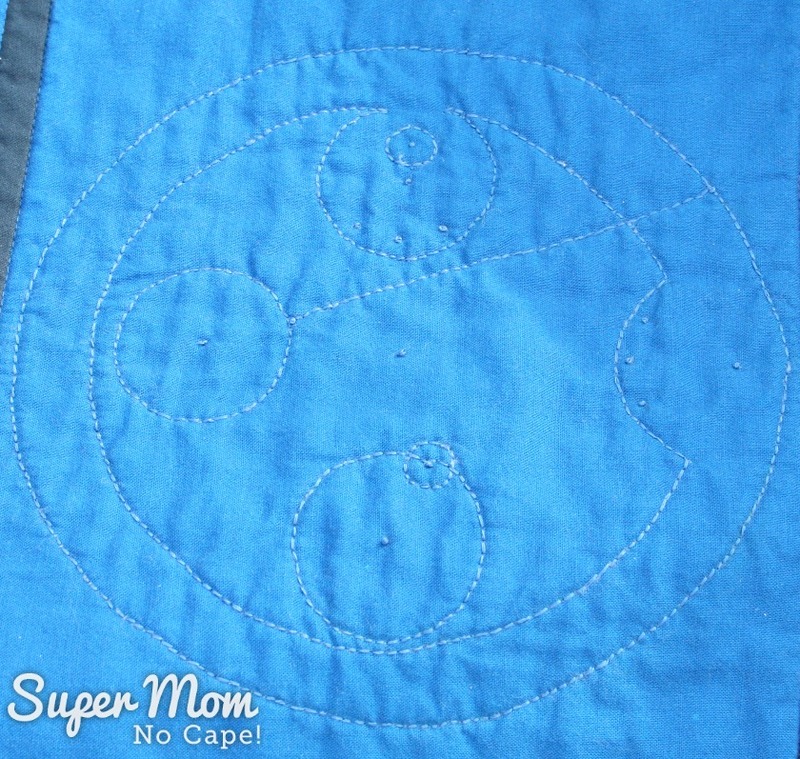 Instead, I embroidered the quilt info on a small scrap of fabric leftover from the TARDIS window panes and stitched it to the Sonic Screwdriver block. 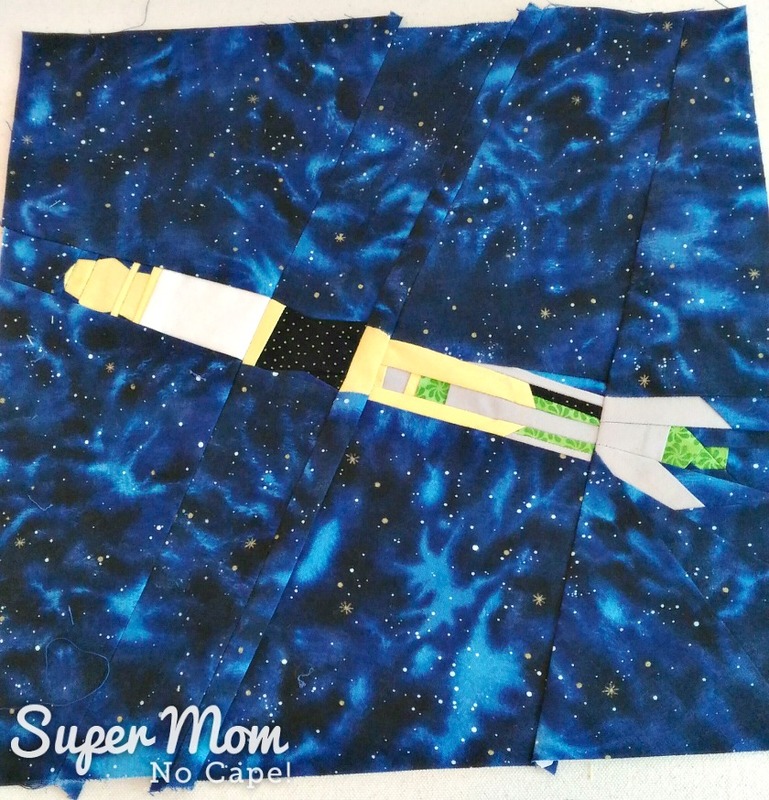 I used the same fabric for the background of the Sonic Screwdriver block as I did for the backing of the quilt so that from a distance, it looks like the Sonic Screwdriver is floating in space. And isn’t that the perfect fabric for the back of TARDIS quilt!! I may have squealed just a bit the day I found it at Jo-ann’s. 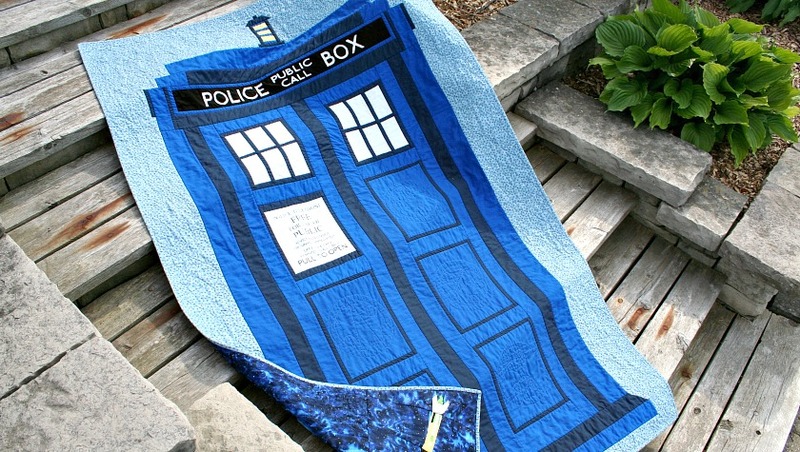 If you like the TARDIS quilt, please be sure save it for future reference by clicking on the Pinterest button underneath this post. This is FABULOUS!! I love all the symbolism you quilted into it and that sonic screwdriver label is perfection!! 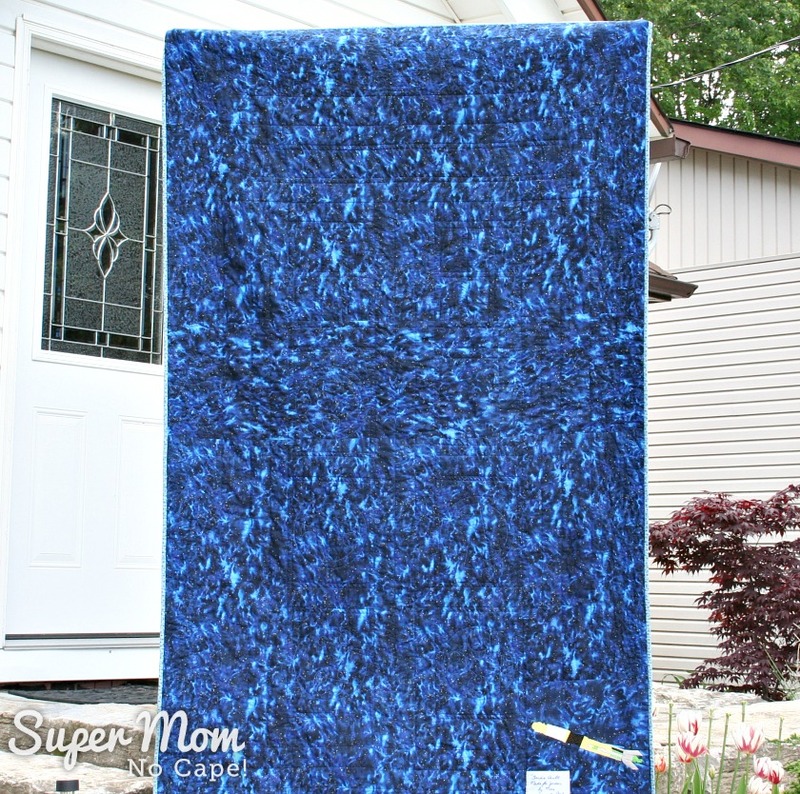 This is a awesome quilt, your son will cherish this quilt forever. 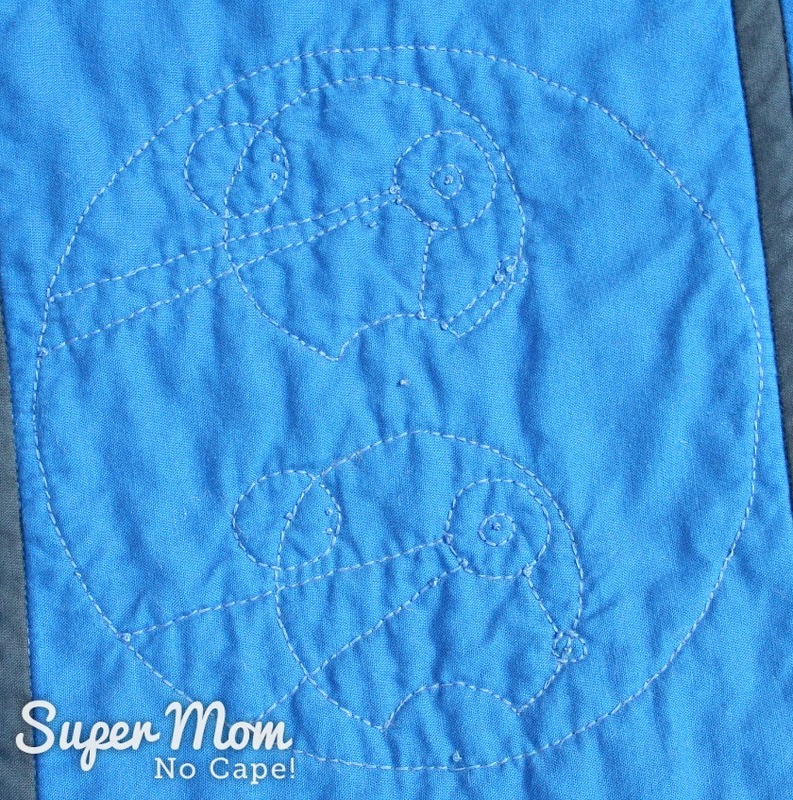 It is indeed an awesome quilt – and “awesome” is not a word I use lightly! You have outdone yourself with this quilt. Indeed it was a brilliant idea and the efforts outstanding. With this quilt I saw two things you married your two interests perfectly – one quilting and your writing which needs obviously needs research just as a journalist. Its a beautiful quilt which will be treasured forever by your son. Perfect. I did try your beetroot salad without edamame as i could not find any organic ones instead went for frozen green peas and used apple cider vinegar for balsamic vinegar. I enjoyed it. Roasted beets are very delicious. Thank you. There were edamame frozen but not organic so didn’t take that chance. Any way I am not familiar with it and the package said soya beans so why go on unfamiliar territory and take a risk. This quilt is wonderful. It is certainly hard to make appropriate gifts for the males in our lives. I made my husband a handsome horse picture before we were married as he is into horse racing and he still doesn’t love it. I do though. 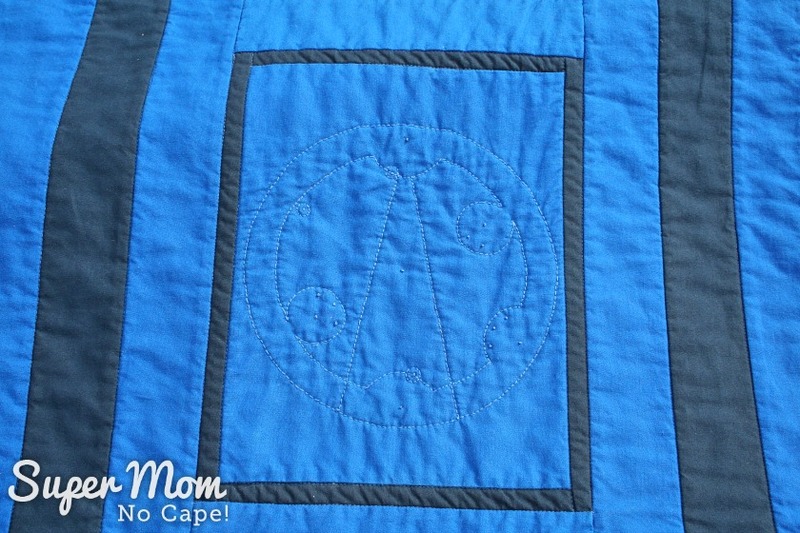 Without a doubt the best Tardis Quilt I have seen, the colors you chose are just perfect, and I love the symbols in Galliefreyan. I imagine your son with cherish this quilt for his lifetime. Beautiful. This turned out amazing! Love it! Definitely pinned it. My son would love it if his mother loved him enough to make this quilt for him. Sadly, she doesn’t. LOL Great quilt and wonderful backing. Very awesome. Years ago I painted my daughter’s door to look like the Tardis. This would have gone perfectly with that. This is beautiful and amazing and I NEED this. OK sorry nothing weird. But honestly, this is a gorgeous piece of art. I hope this goes viral on the Doctor Who sites or something because this is incredible! Wowza! This is a- maze-ing. I’m so impressed, I’ve loved watching this unfold as you’ve shared your progress but the finished thing is just wow! Wow, this quilt is a work of art. You are an incredible talent and obviously hard working. 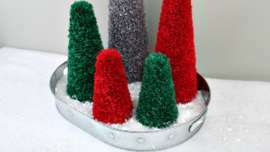 Men truly are almost impossible to find gifts for and your had to be the hit of his Christmas. Stunning quilt and so generous of you to make this. My kids would like to adopt you as their mom. We all love the doctor in our house so this would make a perfect gift for any of them Pinning and sharing too!! Oh wow! I’m not a Dr. Who fan and nobody in my family is either ( I know – horrors!!) but what a fun quilt to make. You found the perfect fabrics for it and I know your son has to be so thrilled with his new quilt.